Derek Jeter is already becoming the premier player at his position. Series title in the 1996 season. Jeter should be one of the most exciting players in baseball over the next decade, along with other shortstops such as Alex Rodriguez, Rey Ordonez, and Nomar Garciapara. While in the minor leagues, Jeter was widely recognized as an upcoming star. In 1994, he was named Minor League Player of the Year by Baseball America, The Sporting News, USA Today Baseball Weekly, and Topps/NAPBL. Since signing with the Yankees in the first round (6th overall pick) June 1992 free-agent draft, Jeter has been been named the Rookie of the Year, and helped lead the Yankees to a World The kid looks like he has what it takes to be one of the games best short-stop. Drafted: Selected by the San Diego Padres in the first round (23rd pick overall) of the 1985 free-agent draft. Acquired: Signed by the Seattle Mariners as a free agent on April 6, 1995. Pre-Majors Highlights: At Vanderbilt in 1985 earned second-team All-America honors. Personal Information: Single ... Resides in Caguas, Puerto Rico ... Hosts annual concerts to benefit his foundation which provides support for children affected by HIV ... younger brother, Alex, a shortstop at the University of Miami, was the Los Angeles Dodgers' third pick in the 1996 June draft. 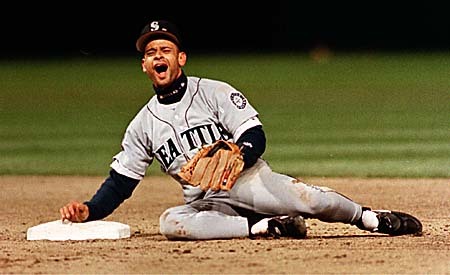 1997 Season On April 21, Joey Cora was hitting a miserable .173. The 10 pounds of muscle he added in the offseason didn't seem to be helping. Then the little second baseman caught fire and after his second four-hit game in four days, he was hitting .379 on May 27. He then became the unlikeliest of All-Stars. You can't believe you're here. That's why I was taking pictures. To show I was here for real, Cora said. Hitting Cora tailed off in the second half and finished near his career norms in batting average and on-base percentage. But his added strength paid off in a .441 slugging percentage, the fourth straight season he has increased that mark. A switch-hitter, he entered 1997 with no career homers batting righthanded, then went deep five times and slugged .617 off southpaws. Cora is a dead fastball hitter. He has learned to work the count a bit deeper, which has resulted in a few more walks and strikeouts. He remains one of the best bunters in the American League. Baserunning & Defense Defensively, Cora is subpar. His range is declining, his arm is weak and he's slow turning the double play. While he has a penchant for making the spectacular play, Cora's inability to turn the pivot was costly on several occasions. He still has average speed, but no longer is a threat to steal. 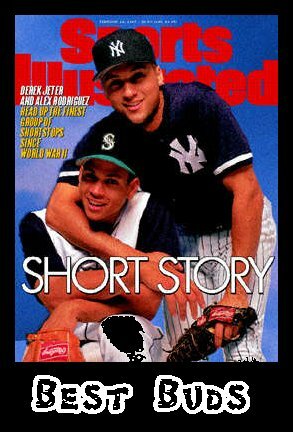 1998 Outlook With Cora becoming a free agent, the Mariners will have a tough decision on whether to re-sign the fan favorite. He's still an effective hitter, but his defensive problems could make him replaceable and his big season will make him expensive. His dropoff in the second half may also be cause for concern. Working in Cora's favor is the fact that Seattle has no strong candidate to replace him. `` Alex is always joking with me,'' Mariner catcher John Marzano said. "He'll say, `Want to go see a movie?' I say, `No, I'm in the lineup tomorrow.' "
Finally, Friday, it was true. Making his first appearance of the year in the starting lineup, Marzano responded with three hits, including a double, in the 17-3 loss. They were his first three hits of the game and boosted his official number of at-bats this year to six. `` To go out there and get good wood on the ball was great on an individual level, but as a team it sucked watching all those hits from behind the plate,'' Marzano said. The biggest differences this year are that Marzano is the No. 3 catcher (behind Dan Wilson and Rick Wilkins) instead of No. 2; and that the pitching staff has fewer young pitchers. Marzano caught most of Bob Wolcott's starts last year and worked with other less-experienced pitchers. Things aren't likely to improve much for Marzano this year and could take a drastic turn. Manager Lou Piniella several times in recent weeks has questioned the value of his decision to carry three catchers this season -- one more than he usually carries. The manager mentioned it again yesterday. Injuries in the Mariner outfield, particularly Jay Buhner's knee surgery and the club's ineffective efforts to replace his offense, have prompted close review of the catcher situation. Piniella said any roster addition of an outfielder will result in considering whether to subtract a catcher to make room. Until then, Marzano said he'll continue to stay ready to play and keep quiet about his playing time. While Marzano keeps trying to avoid Titanic.